This article is about the American football player. For the streetballer, see Deshun Jackson. 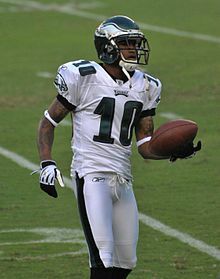 DeSean William Jackson (born December 1, 1986) is an American football wide receiver for the Philadelphia Eagles of the National Football League (NFL). He played college football for the University of California, Berkeley, where he was recognized as a consensus All-American. He was drafted by the Philadelphia Eagles in the second round of the 2008 NFL Draft, and has also played for the Washington Redskins and Tampa Bay Buccaneers. Jackson has been selected to the Pro Bowl three times, and was the first player selected to the Pro Bowl at two different positions in the same year when he was named to the 2010 Pro Bowl as a wide receiver and return specialist. Jackson was born in Los Angeles, California, and grew up in the Crenshaw neighborhood of Los Angeles. He attended Long Beach Polytechnic High School, the same high school as future Philadelphia Eagles teammate Winston Justice and many other current NFL players. He became one of the top wide receiver recruits in the nation, with many collegiate football programs pursuing his services. He was named the 2004 Glenn Davis Award winner by the Los Angeles Times as Southern California's player of the year. He also ran track and played baseball and was scouted by both the Tampa Bay Rays and Philadelphia Phillies in his senior year. In track, he was timed at 10.5 seconds in the 100 meters. Jackson caught 60 passes for 1,075 yards for 15 touchdowns his senior year, leading the Jackrabbits to a CIF Southern Section championship. He was pressed into service last minute as a defensive back in the section title game against Los Alamitos High School, responding with two interceptions, one which he returned 68 yards for a touchdown to help fuel Long Beach Poly's 21–6 victory. To cap off his high school career, Jackson was voted the Most Valuable Player at the U.S. Army All-American Bowl in San Antonio, Texas, where he caught seven passes for 141 yards and passed for a 45-yard touchdown in leading the West to a 35–3 victory in a game that featured 80 of the nation's top players. However, he was also involved in an embarrassing play when he attempted to somersault from the five-yard line for a touchdown, but landed on the one-yard line, leaving the football there. ESPN.com's Tom Lemming rated him as the number four wide receiver in the country, PrepStar Magazine named him an All-American and a member of its Dream Team Top 100 players, and Calhisports.com voted him the 2004 Mr. Football State Player of the Year. He committed to the football program at the University of California, Berkeley under Coach Jeff Tedford, making his announcement on Southern California's FSN West. Jackson waited until the deadline to choose between scholarship offers for California and the University of Southern California. Jackson attended the University of California, where he played for the California Golden Bears football team from 2005 to 2007. Wearing the number 1, in his first collegiate game against Sacramento State in 2005, he scored both an offensive and special teams touchdown, returning a punt 49 yards for a score. Throughout his freshman season, Jackson picked up 38 receptions for 601 yards along with seven touchdowns, eclipsing the 100-yard mark three times. In the 2005 Las Vegas Bowl game against BYU, Jackson tallied 130 yards and two scores. Jackson was also expected to play for Cal's baseball team but, due to the success of his freshman football season, he chose to focus exclusively on football. Coming into his sophomore year with high expectations, Jackson displayed more of his talent and playmaking ability, tallying 1,060 receiving yards and nine touchdowns. Jackson also returned four punts for touchdowns. He earned first-team All-Pac-10 honors as both a punt returner and a wide receiver. Jackson garnered national recognition with selections to first-team All-America by the Associated Press, Walter Camp Football Foundation, the Football Writers Association of America, the Sporting News, and Rivals.com as a punt returner. Jackson also captured the inaugural Randy Moss Award as the top returner in the nation. In one of only two California losses in Pac-10 play, Jackson had a 95-yard punt return for a touchdown against Arizona. Jackson entered his junior season being considered a Heisman Trophy candidate. His season began promisingly, with a 77-yard punt return for a touchdown against Tennessee in the opening game of the season. Against eleventh-ranked Oregon, he caught 11 passes for 161 yards and two touchdowns to lead the Bears to their first victory in Autzen Stadium since 1987. Jackson finished the 2007 season with 65 catches for 762 yards, and scored six touchdowns as a receiver. Jackson was named an All-American as a return specialist. Jackson suffered several minor injuries that limited his effectiveness at times during the season, along with a right thigh injury that forced him to miss most of the game against Washington and the Big Game against Stanford. He also missed the first quarter of the 2007 Armed Forces Bowl for violating undisclosed team rules. 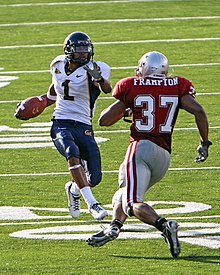 Jackson left Cal following the 2007 season and declared for the 2008 NFL Draft. He departed holding Pac-10 records for punts returned for a touchdown both in a season (four) and in a career (six). Jackson ranks third all-time at California for receiving yards with 2,423 and receiving touchdowns with 22. He is sixth in receptions (162). Jackson finished with 52 career plays of 20 yards or more, making up 23 percent of his 226 touches. Going to the 2008 NFL Draft, Jackson was considered one of the top 10 wide receivers available in a draft class with many talented wide outs. The only knock on Jackson was his small frame, being measured at 5'9¾ " and just over 170 pounds. During the pre-draft period, Hall of Fame wide receiver Jerry Rice was quoted saying that Jackson "has all the talent in the world. There's no reason he can't be everything he wants to be at the next level." At the 2008 NFL Combine, Jackson had an impressive showing, running an official 4.35 40-yard dash. He performed well in positional drills, running routes fluidly, and catching passes very well displaying his well-known agility and quickness. He also posted a standing broad jump of 10 feet. On April 26, 2008, Jackson was drafted in the second round (49th overall) of the 2008 NFL Draft by the Philadelphia Eagles. He was the seventh wide receiver taken, the first time no wide receivers were drafted in the first round. On July 20, he agreed to terms on a four-year contract with the team. Jackson had a good preseason performance, which included a 76-yard punt return for a touchdown against the New England Patriots in the third preseason game. After the Eagles' roster was cut to its maximum 53-man limit for the season, he was listed as the starting punt returner and as a second-string wide receiver. 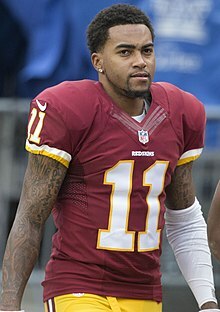 DeSean Jackson during a 2008 game against the Washington Redskins. Due to injuries sustained by Kevin Curtis and Reggie Brown, Jackson was the first rookie to start opening day for head coach Andy Reid. On September 7, Jackson collected six catches for 106 yards in a 38–3 win over the St. Louis Rams. He also returned eight punts for a total of 97 yards, including a 60-yard punt return to set up a field goal. He had over 200 all-purpose yards, a record for a rookie wide receiver. During a Monday Night Football game against the Dallas Cowboys on September 15, Jackson celebrated prematurely before running into the end zone by flipping the football behind him at the one-yard line. This led to what would have otherwise been his first NFL touchdown to be challenged and overturned, with Brian Westbrook running in for a touchdown from the one-yard line on the next play. The Eagles lost the game to Dallas 41-37. Jackson finished the game with 110 yards on six receptions, becoming the only receiver in NFL history to have over 100 yards receiving in each of his first two games besides the Eagles' Don Looney in 1940. On September 28, Jackson recorded his first offensive touchdown against the Chicago Bears. During this game, he also fumbled a punt return that set up the Bears' go ahead score. The following week against the Washington Redskins on October 5, Jackson returned his first punt return for a touchdown 68 yards. Jackson scored his first rushing touchdown on November 9 on a direct snap in the wildcat formation with a nine-yard run against the New York Giants. A rematch against the Giants on December 7 which resulted in a 20-14 upset of the defending Super Bowl champions marked the first time in the season that Jackson did not have a reception. The following week, Jackson rebounded, recording 77 yards on five catches in a 30–10 victory over the Cleveland Browns. In the playoffs, Jackson recorded just 1 catch for 34 yards in the Eagles' wildcard victory over Minnesota, and four catches for 81 yards in a win over the New York Giants. Jackson's final touchdown of the season came in the NFC Championship game on January 18, 2009 against the Arizona Cardinals, when he managed to haul in a 62-yard touchdown to cap a six-catch, 92-yard game. Jackson narrowly finished second to Curtis in postseason receiving yards with 207 to Curtis's 211. Jackson finished a successful rookie season with two receiving touchdowns and a team-leading 62 receptions (the most by an Eagles rookie wide-receiver, second only to tight end Keith Jackson's 81 in 1988, and joining Jackson and Don Looney as the only Eagles to lead the team in receptions their rookie seasons). His 912 receiving yards surpassed Keith Jackson's rookie record of 869. He also led the NFL with 50 punt returns (an Eagles' rookie record and 3rd all time) for 440 yards (third in the NFL, fifth ever by an Eagle, and an Eagles' rookie record). In week 1 against the Carolina Panthers, Jackson had his second punt return for an 85-yard touchdown, the second longest in Eagles history. The following week, Kevin Kolb threw his first career touchdown pass to Jackson against the New Orleans Saints for 71 yards. Jackson had 149 receiving yards against the Kansas City Chiefs on September 27 which included a 64-yard touchdown reception. Against the Oakland Raiders on October 17 he caught six receptions for 94 yards, including a 51-yard diving fingertips catch, in a 13–9 loss. 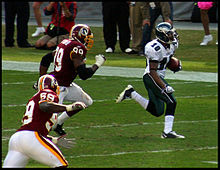 Jackson caught a 57-yard touchdown pass from Donovan McNabb that gave McNabb his 200th career touchdown and 30,000th career passing yards on October 26 against the Washington Redskins on Monday Night Football. He also scored his first rushing touchdown of the season on a 67-yard reverse. Jackson injured his right foot during the game and had an x-ray during halftime, but returned to play during the third quarter. He was later named the NFC Offensive Player of the Week for his efforts. In a week 11 matchup on Sunday Night Football against the Chicago Bears, Jackson caught eight passes for 107 yards and a touchdown as the Eagles won a close game, 24-20. On November 29 against the Redskins, Jackson had to leave the game after sustaining a concussion after a helmet-to-helmet hit by linebacker London Fletcher. Jackson recorded two receptions, including a 35-yard touchdown. Jackson missed the next game due to his concussion, but returned on December 13 against the New York Giants. Jackson had a career day, as he caught six passes for 178 yards including a 60-yard touchdown pass from McNabb and a 72-yard punt return for a touchdown (combined for 261 all purpose yards). The game would also put him at eight touchdowns of over 50 yards in a single season, tying an NFL record shared only by Elroy "Crazylegs" Hirsch and Devin Hester. For his performance against the Giants, Jackson was named NFC Special Teams Player of the Week. The following week against the San Francisco 49ers, Jackson went over the 1,000-yard mark for the season with 140 receiving yards, including a 19-yard touchdown reception as the Eagles clinched a playoff berth. On December 27, he had four catches for 33 yards and a two-yard touchdown, his shortest touchdown of the season, in a win against the Denver Broncos. Jackson was nearly shut down by the Dallas Cowboys in the regular season finale, with only two passes for 36 yards in a 24–0 rout of the Eagles. In a rematch the following week on January 3, 2010 against the Cowboys in the NFC Wild Card Game, he was held by Dallas to three catches for 14 yards, including a six-yard touchdown pass in the 34–14 loss. Jackson ended the season as the Eagles' leading receiver with 1,167 yards. He was selected to the 2010 Pro Bowl as a starting wide receiver and a kick returner, the first time in Pro Bowl history that a player was selected at two different positions. At the Pro Bowl, Jackson caught six passes for a team-high 101 yards and two touchdowns, including a 58-yard catch-and-run touchdown pass from McNabb. He was selected to the Sporting News' All-Pro team as a punt returner for the 2009 season, averaging 15.2 yards per punt return in 2009 as the league leader. After skipping voluntary camp in the spring, Jackson reported to training camp earlier than most veterans. However, he was not speaking to the media and was said to be frustrated about how the Eagles are unwilling to negotiate a contract extension with him. Jackson was carted off the field after he suffered a back injury during the second full team workout of training camp on July 31, but the injury was not serious. In a 35–32 victory over the Detroit Lions, Jackson had 135 receiving yards and a 45-yard catch-and-run touchdown pass. The following week against the Jacksonville Jaguars, Jackson caught a 61-yard touchdown and finished the game with five receptions for 153 yards. However, on October 3 and 10, Jackson caught only five passes for 43 total yards. He scored a pair of touchdowns on October 17 against the Atlanta Falcons, one on a 31-yard run and the second on a 34-yard reception from Kevin Kolb. During the game, he sustained a severe concussion after a collision with Atlanta cornerback Dunta Robinson, with both players assisted from the field. Jackson returned to play on November 7 against the Indianapolis Colts. On November 15, after an altercation with Laron Landry, Jackson caught a then career best 88-yard touchdown pass from Michael Vick on the first play from scrimmage while Landry was covering him in 59-28 a Monday Night Football victory against the Washington Redskins. He surpassed this on December 12 when he had a 91-yard touchdown against the Dallas Cowboys and also finished the game with a personal best 210 receiving yards. Jackson again ended the regular season as the team's leading receiver with 1,056 yards. On December 19, 2010, Jackson returned a punt 65 yards for a touchdown to lead the Eagles to a win against the New York Giants in the final 14 seconds of the game. The Eagles had trailed 31-10 with under eight minutes to play but had come back with three unanswered touchdowns. With 14 seconds left, the game was tied at 31-31 and Jackson received the punt. He fumbled at first, but then picked it up and ran 65 yards for the score, running parallel to the goal line when he reached it in order to wind out the time. This punt return is the first and only game-winning punt return on the final play from scrimmage in the history of the NFL. On July 28, 2011, Jackson failed to report to Eagles' training camp at Lehigh University in Bethlehem, Pennsylvania as required in his contract. His agent, Drew Rosenhaus, offered no immediate explanation for his absence. Jackson faced fines of $30,000-a-day until he reported to camp. His deadline to report was August 9 or he would have lost a year of service time toward free agency. Jackson's holdout ended on August 8 when he reported to training camp. On November 13, in a game against the Arizona Cardinals, Jackson was deactivated for missing a special teams meeting. The following week in a matchup against the New York Giants, Jackson flipped the ball at New York defensive coordinator Perry Fewell after making a 50-yard reception and was flagged for taunting, drawing a $10,000 fine for unsportsmanlike conduct. In a November 27 loss to the New England Patriots, he was benched for the entire fourth quarter after a performance that included drops of two potential touchdown passes. Jackson ended the season as the Eagles' leading receiver with 961 yards. He also had the lowest total punt return yards of his career with 114 and did not return a punt for a touchdown during the 2011 season. Jackson received the Eagles' franchise tag on March 1, 2012. He was re-signed to a five-year contract worth up to $51 million on March 14. He had more than 100 yards receiving against Baltimore and New Orleans before fracturing his ribs in Week 12 against the Carolina Panthers. In 11 games, he had 45 receptions for 700 yards; his 77-yard touchdown catch against New Orleans was the longest by an Eagles player that season. Jackson began the 2013 season with 104 yards against Washington, and followed this with career-bests in receptions yards (nine and 193) against San Diego. After a 132-yard game 5 (for which he won offensive player-of-the-week honors), he had his first career multiple-receiving-touchdown game against Tampa Bay. In week 14 against Minnesota, he again set new career marks with 10 receptions for 195 yards. On the year, he led the team with 82 receptions for 1,332 yards (4th and 2nd most by an Eagle in a season). Though this was statistically the best season of his career, and led to his third Pro Bowl selection, Jackson was released by the Eagles on March 28, 2014. He left the Eagles with the franchise's 4th most receiving yards (6,117), 8th most receptions (356), 9th most receiving touchdowns (32), and tied for the 3rd most 100+ receiving-yard games (20). On April 2, 2014, Jackson signed with the Washington Redskins to a reported three-year, $24 million contract with $16 million guaranteed. On the NFL Network's Top 100 Players of 2014, Jackson was voted the 63rd best player (overall) in the league by his peers. On September 14, 2014, Jackson suffered a bruised left shoulder against the Jacksonville Jaguars and was forced to leave the game in the first half. Despite the injury, he would play the following week against Eagles in his return to Philadelphia. In the game, he scored an 81-yard touchdown pass from quarterback Kirk Cousins. The jersey that Jackson wore in that game would be featured at the Pro Football Hall of Fame after he became the third player in NFL history to record an 80-yard touchdown both for and against a team. On October 17, 2014, Jackson was fined $16,537 for a horse-collar tackle on Arizona Cardinals safety Rashad Johnson in Week 6. Jackson broke 100-yards receiving in six games that season, and ended with 56 receptions for a team-leading 1,169 and 6 touchdowns, and led the NFL for the second time in his career with 20.9 yards per catch. On August 6, Jackson suffered a shoulder injury that kept him sidelined for most of pre-season training, and then injured a hamstring in the first quarter of the season opener against Miami. Jackson did not return until November 8, and even then saw limited duty over the remaining 10 games of the season. While injured, Jackson's home in Tarzana, California was reportedly attacked and violently defended by guests while he was away. On December 20, Jackson caught a 77-yard touchdown pass from Cousins as part of his only 100 yard game of the season (6 catches for 153 yards). The next week, Jackson was booed by the Philadelphia crowd as he contributed to the Redskins' 38-24 division-clinching victory. He ended the season with 30 catches for 528 yards (career lows) and 4 touchdowns. Jackson appeared to return to form with 6 catches for 102 yards in a season-opening loss to the Pittsburgh Steelers. He caught at least one pass in each of the 16 games that season, though production was lower during the season's middle. In week 4, he was fined for wearing police caution tape on his shoes to protest the role of race in the American criminal justice system. He went over 100 yards in four-out-of-five games late in the season, including 3 catches for 102 yards, and a go-ahead 80-yard touchdown against his former team on December 11 in Philadelphia. Following a 7-reception, 111-yard effort the next week, Jackson was fined a second time in the season for the color of his cleats. Both he and teammate Pierre Garçon reached 1,000 yards receiving in a season-finale loss to the Giants, becoming the first Redskins tandem since 1999 to achieve this feat, and also becoming the 7th and 8th Redskins in history with multiple 1,000 yard receiving seasons. He ended the year with 56 receptions for 1,005 yards and 4 touchdowns, leading the NFL for the third time with 17.9 yards per catch. On March 9, 2017, Jackson signed a three-year, $33.5 million contract with the Tampa Bay Buccaneers. On September 24, Jackson caught his first touchdown as a Buccaneer against the Minnesota Vikings. On October 5, Jackson caught five passes for 106 yards in a 19-14 loss against the New England Patriots. Overall, in the 2017 season, he recorded 50 receptions for 668 receiving yards and three receiving touchdowns. On September 9, 2018, Jackson caught five passes for 146 yards and two touchdowns in the season-opening 48-40 win over defending NFC South champions New Orleans Saints. The performance was his second career game with two receiving touchdowns (58 and 36 yards), despite leaving the game with a concussion. His 58-yard touchdown reception was his 27th-career touchdown over 50 yards, which tied him for third most in NFL history, behind Randy Moss (29) & Jerry Rice (37). He also surpassed 100 yards in Week 2 against the Philadelphia Eagles (129 yards and a touchdown) and Week 4 against the Chicago Bears (112 yards), to enter Tampa Bay's bye-week seventh in the NFL in receiving yards and first in yards-per-reception at 24.9. His output significantly declined from this point, however. Over the next seven games, he averaged three receptions for 47 yards per game, and had only one touchdown reception (though he added a rushing touchdown in Week 7 against the Cleveland Browns), before an achilles tendon injury sidelined him for all but one reception over the last five weeks of the season. Despite this "disappointing" end to the season, the 32-year-old Jackson still ended the 2018 season with enough receptions (41 for 774 yards) to qualify as the league-leader in yards-per-reception (18.9) for the fourth time in his career. On March 13, 2019, Jackson and a 2020 seventh-round selection were traded to the Eagles in exchange for a 2019 sixth-round selection. Jackson has 24 career touchdowns of 60 or more yards, which is the most in NFL history. Jackson has also received media attention for plays that critics say show poor judgement on his part, and in particular, multiple premature celebrations which have resulted in lost touchdowns. Especially notable was a play in which Jackson intentionally dropped the ball as part of a celebration, but did so one yard before reaching the end zone. Jackson is the son of Bill and Gayle Jackson, and his oldest brother, Byron, is a former San Jose State wide receiver who spent two seasons on the Kansas City Chiefs' practice squad. His father was hospitalized with pancreatic cancer during the Eagles run in the 2009 playoffs, and died on May 14, 2009. Jackson currently resides in Moorestown, New Jersey. Jackson was featured on the cover of the PlayStation 2 version of NCAA Football 09. Jackson took part and won a competition of Hole in the Wall in April 2011. ^ Tafur, Vic (May 21, 2011). "NFL star DeSean Jackson talks bullying in Oakland". SFGate. Retrieved July 20, 2016. ^ "Glenn Davis Award winners". Los Angeles Times. January 4, 2011. Retrieved December 15, 2018. ^ a b "Eagles' Jackson had tools for baseball". Philly.com. Archived from the original on October 25, 2008. ^ "Former NFL Player makes TV Series About His Brother". Los Angeles Sentinel. July 2, 2015. Retrieved December 15, 2018. ^ "DeSean Jackson is proving to be college football's best and roughest players". ESPN.com. August 27, 2007. Retrieved December 15, 2018. ^ a b c d e Simmons, Rusty (January 15, 2008). "Jackson Leaving Cal For NFL". San Francisco Chronicle. Retrieved October 12, 2010. ^ "Desean Jackson College Stats". College Football at Sports-Reference.com. Retrieved December 15, 2018. ^ "CGB Hall Of Fame: (4) DeSean Jackson v (13) Nate Longshore". California Golden Blogs. May 6, 2012. Retrieved December 15, 2018. ^ "Golden Bears Hold Off Cougars in Vegas". The New York Times. December 23, 2005. Retrieved December 15, 2018. ^ "No. 6 California 31, No. 11 Oregon 24". The Seattle Times. September 30, 2007. Retrieved December 15, 2018. ^ Ratto, Ray (December 2, 2007). "Stanford believed it had Cal's number". San Francisco Chronicle. Retrieved October 12, 2010. ^ Simmons, Rusty and Michelle Smith (November 29, 2007). "Cal's Jackson uncertain for action Saturday". San Francisco Chronicle. Retrieved October 12, 2010. ^ Hawkins, Stephen (January 1, 2008). "Cal receivers lead spectacular rally". Seattle Times. Archived from the original on June 22, 2011. Retrieved October 12, 2010. ^ "*DeSean Jackson, DS #2 WR, California". Nfldraftscout.com. Retrieved January 30, 2010. ^ a b Kirwan, Pat. "Draft's top wide receivers". NFL.com. Archived from the original on December 23, 2008. Retrieved January 7, 2009. ^ Smith, Michael David (November 7, 2009). "Jerry Rice is a DeSean Jackson fan". profootballtalk.com. Retrieved October 12, 2010. ^ "2008 NFL Draft Listing". Pro-Football-Reference.com. Retrieved December 15, 2018. ^ "DeSean Jackson did WHAT?! The Bucs receiver's most unbelievable moments". Tampa Bay Times. March 13, 2017. Retrieved December 15, 2018. ^ "St. Louis Rams at Philadelphia Eagles - September 7th, 2008". Pro-Football-Reference.com. Retrieved December 15, 2018. ^ Quintong, James (September 16, 2008). "Jackson's antics cost many fantasy owners". ESPN.com. Retrieved October 12, 2010. ^ "Philadelphia Eagles at Chicago Bears - September 28th, 2008". Pro-Football-Reference.com. Retrieved December 15, 2018. ^ Maaddi, Rob (November 10, 2008). "Manning leads Giants over Eagles". Yahoo! Sports. Retrieved November 10, 2008. ^ Domowitch, Paul. "Eagles throw Giants a curve with ground game". Philly.com. Archived from the original on December 12, 2008. Retrieved December 8, 2008. ^ "Wild Card - Philadelphia Eagles at Minnesota Vikings - January 4th, 2009". Pro-Football-Reference.com. Retrieved December 15, 2018. ^ "Divisional Round - Philadelphia Eagles at New York Giants - January 11th, 2009". Pro-Football-Reference.com. Retrieved December 15, 2018. ^ "NFC Championship - Philadelphia Eagles at Arizona Cardinals - January 18th, 2009". Pro-Football-Reference.com. Retrieved December 15, 2018. ^ "2008 Philadelphia Eagles Statistics & Players". Pro-Football-Reference.com. Retrieved December 15, 2018. ^ "Jackson hyperextends knee in drill". ESPN.com. August 8, 2009. Retrieved October 26, 2010. ^ Cranston, Mike (September 13, 2009). "McNabb injured in Eagles' 38-10 rout of Panthers". Yahoo! Sports. Retrieved September 13, 2009. ^ "New Orleans Saints at Philadelphia Eagles - September 20th, 2009". Pro-Football-Reference.com. Retrieved December 15, 2018. ^ Grotz, Bob. "Eagles' Jackson making big plays off the field, too". The Delaware County Daily Times. Retrieved December 15, 2018. ^ "Philadelphia Eagles at Oakland Raiders - October 18th, 2009". Pro-Football-Reference.com. Retrieved December 15, 2018. ^ Allen, Scott. "DeSean Jackson's five best games against the Redskins". Washington Post. Retrieved December 15, 2018. ^ Burke, Chris (November 29, 2009). "DeSean Jackson Suffered Concussion". FanHouse. Retrieved October 26, 2010. ^ Eichenberger, Bill (December 14, 2009). "Dynamic Jackson leaves Giants dizzy, grasping for air". Sporting News. Retrieved December 14, 2009. ^ Grotz, Bob (December 16, 2009). "Eagles' Jackson scores another award". The Times Herald. Retrieved October 26, 2010. ^ Maaddi, Rob (December 20, 2009). "Eagles clinch playoff berth, 27-13". Yahoo! Sports. Retrieved December 20, 2009. ^ "Denver Broncos at Philadelphia Eagles - December 27th, 2009". Pro-Football-Reference.com. Retrieved December 15, 2018. ^ "Philadelphia Eagles at Dallas Cowboys - January 3rd, 2010". Pro-Football-Reference.com. Retrieved December 15, 2018. ^ "Wild Card - Philadelphia Eagles at Dallas Cowboys - January 9th, 2010". Pro-Football-Reference.com. Retrieved December 15, 2018. ^ "2009 Philadelphia Eagles Statistics & Players". Pro-Football-Reference.com. Retrieved December 15, 2018. ^ "2010 NFL Pro Bowlers". Pro-Football-Reference.com. Retrieved December 15, 2018. ^ "Eagles' DeSean Jackson named Pro Bowler at two positions, joining five teammates at Pro Bowl". Press of Atlantic City. Retrieved December 15, 2018. ^ Fierro, Nick (July 31, 2010). "Eagles' Jackson tweets his way though conditioning test". The Morning Call. Retrieved July 29, 2010. ^ Silva, Evan (July 31, 2010). "DeSean Jackson's injury isn't serious". profootballtalk.nbcsports.com. Retrieved July 31, 2010. ^ "What We Saw". philly.com. Retrieved December 15, 2018. ^ "Vick leads Eagles past Jaguars". The Delaware County Daily Times. Retrieved December 15, 2018. ^ "Atlanta Falcons at Philadelphia Eagles - October 17th, 2010". Pro-Football-Reference.com. Retrieved December 15, 2018. ^ "DeSean Jackson exits after hard hit". ESPN.com. October 18, 2010. Retrieved October 18, 2010. ^ Levin, Michael (November 15, 2010). "Michael Vick Hits Desean Jackson for 88-yard Touchdown". SB Nation Philly. Retrieved December 15, 2018. ^ "Eagles WR DeSean Jackson burns Cowboys for 210 yards, rubs it in". SportsDay. December 13, 2010. Retrieved December 15, 2018. ^ "2010 Philadelphia Eagles Statistics & Players". Pro-Football-Reference.com. Retrieved December 15, 2018. ^ Branch, John (December 20, 2010). "Eagles Stun Giants on Game's Final Play". The New York Times. Retrieved December 19, 2010. ^ Associated Press. "DeSean Jackson's 65-yard punt return caps Eagles' 21-point comeback". ESPN. Retrieved December 20, 2010. ^ "DeSean officially a holdout", Philadelphia Inquirer, July 28, 2011. ^ "Eagles WR Jackson ends holdout, reports to camp". Sports Illustrated. August 8, 2011. Retrieved August 8, 2011. ^ "Report: DeSean Jackson deactivated". NFL News: FOX Sports. Retrieved November 28, 2011. ^ "Roundup: Eagles' Jackson fined $10,000 for taunting Giants". NFL.com. November 25, 2011. Retrieved November 28, 2011. ^ "Eagles' Jackson benched during fourth quarter of loss to Pats". NFL.com. November 27, 2011. Retrieved November 28, 2011. ^ "2011 Philadelphia Eagles Statistics & Players". Pro-Football-Reference.com. Retrieved December 15, 2018. ^ "Eagles place franchise tag on WR DeSean Jackson". nfl.com. Retrieved December 15, 2018. ^ Florio, Mike (March 14, 2012). "DeSean Jackson agrees to five-year deal with Eagles". profootballtalk.com. Retrieved March 14, 2012. ^ Sessler, Marc (November 27, 2012). "DeSean Jackson of Philadelphia Eagles placed on IR". National Football League. Retrieved November 27, 2012. ^ "2012 Philadelphia Eagles Statistics & Players". Pro-Football-Reference.com. Retrieved December 15, 2018. ^ Ciarrocchi, Dan (September 10, 2013). "DeSean Jackson logs 104 yards in Eagles opener". SBNation.com. Retrieved December 15, 2018. ^ "Philip Rivers steers San Diego Chargers past Eagles". NFL.com. Retrieved December 15, 2018. ^ "DeSean Jackson dominates Vikings". CBSSports.com. Retrieved December 15, 2018. ^ "2013 Philadelphia Eagles Statistics & Players". Pro-Football-Reference.com. Retrieved December 15, 2018. ^ "Eagles Release WR DeSean Jackson". philadelphiaeagles.com. Retrieved March 29, 2014. ^ "DeSean Jackson Signs 3-Year, $24M Deal With Redskins". CBSNewYork/AP. April 2, 2014. ^ "NFL Top 100 - Top 100 Players of 2013". NFL.com. Retrieved December 6, 2017. ^ Weinreich, Marc (September 14, 2014). "Redskins WR DeSean Jackson reportedly suffers bruised shoulder". SI.com. Retrieved September 14, 2014. ^ Walker, Andrew (September 21, 2014). "Redskins Drop 37-34 Decision To The Eagles". Redskins.com. Retrieved October 5, 2014. ^ Czarda, Stephen (October 4, 2014). "DeSean Jackson's Jersey Now On Display At Pro Football Hall Of Fame". Redskins.com. Retrieved October 5, 2014. ^ "Fines roundup: DeSean Jackson docked $16,537". NFL.com. Retrieved December 15, 2018. ^ "DeSean Jackson 2014 Game Log". Pro-Football-Reference.com. Retrieved December 15, 2018. ^ Clarke, Liz (September 14, 2015). "After missing preseason, DeSean Jackson suffers another injury in Week 1". Washington Post. Retrieved January 2, 2017. ^ Breach, John (October 23, 2013). "Police: DeSean Jackson's home in LA robbed, at least one person injured". CBSSports.com. Retrieved January 2, 2017. ^ Keim, John (December 20, 2015). "DeSean Jackson up, Jamison Crowder down in Redskins' win". ESPN.com. Retrieved December 15, 2018. ^ "DeSean Jackson 2015 Game Log". Pro-Football-Reference.com. Retrieved December 15, 2018. 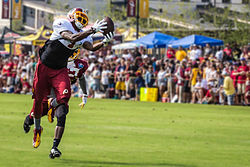 ^ "Redskins' offense snap counts vs. Steelers: DeSean Jackson a rare bright spot in loss". Washington Post. Retrieved December 15, 2018. ^ a b Allen, Scott (December 21, 2016). "DeSean Jackson can't believe he got fined for the custom cleats he wore Monday". Washington Post. Retrieved January 3, 2017. ^ Getzenberg, Alaina (December 13, 2016). "Drive Of The Game: 80-Yard Touchdown Pass To DeSean Jackson Put Redskins Ahead". Redskins.com. Retrieved January 3, 2017. ^ Jones, Mike (January 1, 2017). "Pierre Garçon, DeSean Jackson reach 1,000-yard milestone in loss". Washington Post. Retrieved January 3, 2017. ^ "DeSean Jackson 2016 Game Log". Pro-Football-Reference.com. Retrieved December 15, 2018. ^ Orr, Conor (March 9, 2017). "DeSean Jackson agrees to three-year deal with Bucs". NFL.com. Retrieved March 14, 2019. ^ Kania, Joe (September 24, 2017). "5 Takeaways from Buccaneers vs. Vikings". Tampa Bay Buccaneers. ^ Smith, Scott (October 5, 2017). "Buccaneers Lose Under the Lights". Tampa Bay Buccaneers. ^ "DeSean Jackson: Career Stats at NFL.com". NFL.com. Retrieved October 2, 2018. ^ "Tampa Bay Buccaneers at New Orleans Saints - September 9th, 2018". Pro-Football-Reference.com. Retrieved March 14, 2019. ^ Jones, Kaelen (September 9, 2018). "Bucs' DeSean Jackson concussed vs. Saints". SI.com. ^ Smith, Scott (September 10, 2018). "DeSean Jackson, Mike Evans Soar to New Heights". Buccaneers.com. ^ Macy, Evan (September 16, 2018). "For some reason, DeSean Jackson still owns the Eagles". PhillyVoice. Retrieved October 5, 2018. ^ "DeSean Jackson Career Game Log". Pro-Football-Reference.com. ^ "DeSean Jackson Fantasy Football News & Stats". www.rotowire.com. ^ "DeSean Jackson 2018 Game Log". Pro-Football-Reference.com. Retrieved March 14, 2019. ^ "2018 NFL Receiving". Pro-Football-Reference.com. Retrieved March 14, 2019. ^ "Eagles acquire WR DeSean Jackson from Tampa Bay Buccaneers". PhiladelphiaEagles.com. March 13, 2019. Retrieved March 14, 2019. ^ a b "DeSean Jackson Stats". ESPN Internet Ventures. Retrieved January 5, 2015. ^ Chiappelli, Kirstie (October 28, 2018). "DeSean Jackson breaks Jerry Rice's record with 60-yard TD catch". Sporting News. Sporting News Media. Retrieved December 28, 2018. ^ "Where does DeSean Jackson's absurd backward fumble rank on his list of all-time stupid plays?". usatoday.com. December 8, 2015. ^ Allen, Jennifer (June 20, 2009). "In spirit, father of Eagles WR DeSean Jackson continues to inspire". NFL.com. Retrieved October 26, 2010. ^ "DeSean Jackson inadvertently revealed as PS2 NCAA Football 09 cover athlete". PastaPadre.com. April 28, 2008. Retrieved September 16, 2008. ^ "Hole in the Wall Episodes on Fox". tvguide.com. Retrieved June 24, 2011. Wikimedia Commons has media related to DeSean Jackson. This page was last edited on 16 March 2019, at 17:45 (UTC).